As you can see, it adds the keys at the end of the sections, and I would, obviously, prefer them to be after the other Path keys. So can anyone help me with a code that can do that? Thanks in advance. Acutally I considered your reasons to be out of a cosmetic concern. FWIW, in case someone else has a problem (or you're interested), here's what I've been using for the GMDX and HDTP installers (which will probably be open-sourced on final, mainly as a help towards this kind of purpose). Note that while DeusEx.ini is generally compatible with the INI file facilities available through the OS, since Paths is a duplicate key, it doesn't work. But one can use the TStringList equivalent to do it. ndx1 := sstrings.IndexOf('Paths=..\GMDX\System\*.u'); // locate target line. sstrings.Delete(ndx1); // if already exists, delete it. 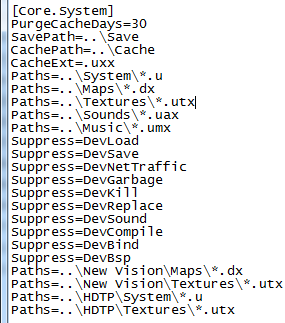 ndx1 := sstrings.IndexOf('Paths=..\System\*.u'); // find systems line - will always exist if DeusEx.ini isn't borked. if ndx1 > -1 then // if it exists. ndx2 := sstrings.IndexOf('Paths=..\HDTP\System\*.u'); // look for HDTP system line. sstrings.Insert(ndx1, 'Paths=..\GMDX\System\*.u'); // if not, put it after the system line. Depending on whether HDTP is present. The main thing is to make sure the target line is placed before the line in which the resources exists. I believe inno setup allows you to package and execute built executables so you could simply write your script in whatever programming language you prefer and then bundle it into the installer to be executed on installation. Afaik non existing Paths are ignored anyway, so it would be probably save to just always have the HDTP entry. And why do you actually modify the game's ini file instead of supplying a Default.ini to be used when starting GMDX? And why do you actually modify the game's ini file instead of supplying a Default.ini to be used when starting GMDX? It's a safer behavior in terms of not breaking any other things or settings as many of the other mod installers do. For instance, the New Vision installer does this and as a result is one of the banes of my existence re the HDTP installer script. Well, as you mentioned, to help others, who work on projects like this, here's what I got from other communities. Obviously, your code is much shorter, but I like to keep thing separate (I have a bit of concentration problem).